Have between 3-5 main points. Think “less is more.” The best lectures only cover a limited number of topics, as then they can be covered in sufficient detail without being exhaustive. If you have 9 points that you want to make, find out a way to chunk them into 3-5 to help students process it all. Avoid writing lecture like a script. When composing a lecture, your impulse may be to script your lecture word-for-word. However, with a scripted lecture, the inclination becomes reading it, as opposed to producing it from memory or presenting it in a conversational way. One way to combat this is to not write the lecture like a script, but instead to write out bullet points for those main points. If you’re particularly nervous and are driven to script your lecture for fear that you will get in front of students and freeze, then we recommend scripting the first 4-5 minutes of your talk (to help you ease into your lecture) and to only use that script as a safety net if you need it. A few minutes into your lecture, you’re likely to feel more comfortable and won’t need your notes as much. You can also keep your bulleted notes in presenter view in PowerPoint, so you can still make sure that you’re covering what you intended. Practice, practice, practice! Before your lecture, practice your lecture in real time at least a few times out loud. Your words are likely to sound different in your head rather than when you’re practicing out loud. This form of practice will also give you an idea of timing, as you can test how long your lecture is and whether you have too much or too little content for your designated lecture period. Post incomplete slides online (if using PowerPoint). There are some clear benefits to posting slides online before the start of class. First, rather than focusing on writing down what’s on the slides, students can focus on what you’re saying and write down what’s truly important. Second, if slides are incomplete, coming to class will be integral to students’ success in the course, as the online slides are a poor substitute for all that will be covered during the actual lecture. In general, slides should have enough information to help students organize the content, but not so much information as to be exhaustive. Engage students in conversation. Arrive early to set up and then spend the last few minutes before class talking with students as they’re walking into the classroom. Davis (2009) suggests that using your voice informally before the lecture will help you continue to use your voice conversationally during your lecture. Therefore, use this time to get to know your students and to “warm up” for your lecture. Start with outline and learning goals. Rather than just diving in head first, give students (and yourself) a minute to warm up to the lecture and to help them mentally organize the material by starting with an outline. Once you’ve presented your outline of topics, it’s a good idea to present your learning goals for students. This gives them an idea of which concepts are the most important and to help them figure out what they should be taking away from today’s lecture. This also helps them make sure to focus on those points. Don’t be afraid to wander. The best lecturers know how to work the room and one of the best ways to do so is to create some distance between yourself and the podium. Using a clicker, you can lecture from nearly anywhere in the classroom, so feel free to wander about, disperse eye contact around the entire classroom, and lecture like a seasoned professional. Body positioning and voice. If using the white board, make sure to open your body up to the classroom equitably. Specifically, be conscientious about not speaking to the board, but opening your shoulders to the classroom and speaking to students. Moreover, when opening up, make sure that you’re not consistently putting your back to the same side of the classroom, as these students are not getting the same lecture experience then as those students to whom you’re facing. The average student’s attention span is between 15-20 minutes (Bligh, 2000). Considering such, in a 50- to 75-minute lecture, incorporating active learning 3-5 times throughout the class is a good way to maintain students’ attention and increase learning. In fact, increased student engagement and interactions leads to greater gains in learning and retention (Knight and Wood, 2005). Below are some active learning techniques to consider in your classroom when lecturing. Jigsaw. In this method, break students into groups with each team being responsible for a different article, question, or part of a problem. 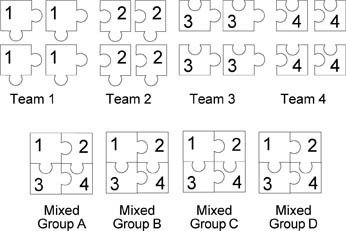 After each team figures out their piece and they become “experts” in their part, mix the groups so that one person from each team is in each new group (see diagram below). Then have each team member teach their piece to their new group and together they can complete the puzzle by combining their knowledge. To learn more about lecturing–including more active learning strategies, incorporating multimedia, and ending your lecture on a strong note–keep an eye out for our Effective Lecture Strategies workshop in the future.